So I've been using a jetboil since my house mate game me his old one about three years ago. Obviously enough, I love the speed and self-contained nature of it but the weight, lack of temperature control and that useless PS plastic knob are downsides. As a result I've been reassessing titanium pot and other burner options. So, I was weighing some of my existing bits of gear trying to decide whether the trade-offs were worthwhile when something occurred to me. The jetboil pot is pretty much identical to my old Macpac pot aside from the heat exchanger, which adds 40g. The burner is twice as heavy as my Kovea at 120g. But most of the advantage seems to be in the HX - the kovea burner is basically better in every way and half the weight. So my question is: am I an idiot who's gonna blow himself to bite-size chunks or a low-key genius? I'm no engineer but can't see why this wouldn't work safely - the bits taking extra heat load are the pot stand arms and burner itself, ie bits that already take heat and are designed for it. Airflow will be a bit lower than with a "normal" pot of the same size but plenty of people use them with reflectors and windshields... and much wider based pots. Obviously the jetboil also has a little reflector and lower plastic windshield, but at 50% of the weight I'm happy to compromise on performance. The kovea burner directs the flame outward rather than directly up, but my old setup was a pot with the same diameter so all the heat that went outside the base of the pot was lost - this should at least transfer some via the heat exchanger fins. Stability-wise, the three pot stand arms nest quite snugly into the fins. If it becomes a long-term solution I'll probably bend three of the fins slightly to widen the gap and mark them on the outside of the pot. To install, I rotate the arms to separate two of them, place through the jetboil base then fully open the three arms and nestle into the fins. Removal is simple enough... Cold. OK, there is nothing new under the sun. Looks like I'll be needing a Dremmel tool at last. I ran a very unscientific* experiment. Test 1 (control): Kovea Ti stove with ALU pot (same diameter and volume as jetboil pot). Test 2: Kovea Ti stove with jetboil. The stove was probably set to between 25 and 35% to achieve reasonable output without noticeable flame encroaching around the side of the stove. I did singe the webbing handle a little, which I've now removed. I'll probably use this setup without cutting slots into the jetboil pot windshield/surround as this gets the burner closer to the base of the pot. Being very convex it's prone to sending a fair bit of heat and even flame around the side of the pot. I might eventually drillium or entirely remove that windshield once I've field tested this setup to satisfaction. I'll also make a reflector that can be slotted onto the burner as I came across some suggestions that this functions to keep the canister cool as well as improving efficiency. *to control as many variables as possible I allowed everything to cool to ambient temp between each test and used the most sheltered corner of my balcony, out of the sun. I don't think the ambient temperature changed significantly and there wasn't any perceptible wind. Singe wrote: *to control as many variables as possible I allowed everything to cool to ambient temp between each test and used the most sheltered corner of my balcony, out of the sun. I don't think the ambient temperature changed significantly and there wasn't any perceptible wind. You need to control the stove output. 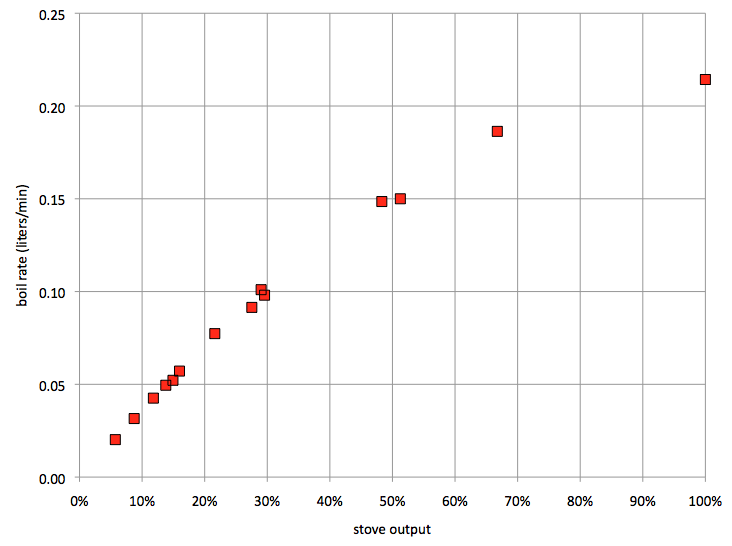 Saying it's "probably set to between 25 and 35%" introduces a huge margin of error since stove efficiency is quite sensitive to the heating rate. You also need to be sure you're heating the same amount of water at the same starting temperature. On top of that, determining the point that boiling starts is subjective, but it's probably the least of your concerns. Get a good scale, one that can resolve to fractions of a gram for the fuel canister. You're probably only burning around 5g of fuel per test so to get decent accuracy you'll want a scale that resolves to 0.1g at the least. Or you can repeat the test multiple times to get a larger total fuel usage. Just filling the pot and timing the boil is a notoriously unreliable way to test stove efficiency. You can judge the 'repeatability' of your tests by repeating the same test ... multiple times .. say 6, to get some idea of how 'accurate' the results are. The closer together the repeated test results are the better your test is. For even better test judgement repeat the starting test at the end - that will tell you of any variation over time .. temperature, sun, wind, gas pressure etc can all contribute to 'errors' in the measurement. Of course you 'd want to repeat the starting test those 6 times for you can see if it is worthwhile doing the tests, and if any test falls within the start test results then it means that test may well be the same as the start tests results. I'm satisfied the kovea isn't significantly slower - in windless conditions at least - but wouldn't conclude that it's 'better' based on one admittedly unscientific test. I took 'rolling boil' as the point the lid was displaced. Even if we call that +/-10 seconds, the results are still at worst equal. Good enough for me to persist; maybe I'm kidding myself? Good tip on weighing the gas before/after; this might be phase 2. The Acaia coffee scale I used to measure out the water is accurate to 0.01g so should do the trick. I love tests like this, you should totally keep it up. I've looked at jetboil clones because they're about $50 these days, but they are definitely heavier - I could spend that money on a Ti pot. One guy made a test between two cooking systems where the heat exchanger system weighted 143g more than the one without, but used 4g less fuel per 1l water boiled (11g vs 15g). He boiled 2l on a regular day, with a total saving of 8g per day if using heat exchangers. 8g saved fuel per day meant almost 18 days on the trail before he saved weight from the 143g extra that the heat exchanger cooking system weighted (143/8). Of course the amount of days before you save weight depends on the weight difference between a system with heat exchangers and one without. Less difference means you save weight faster. If speed is the main goal then turn the stove up to full blast. To first approximation boil speed is proportional to the stove setting. Orion wrote: If speed is the main goal then turn the stove up to full blast. To first approximation boil speed is proportional to the stove setting. Very interesting - wouldn't've expected such a linear relationship! How does it impact efficiency? TBH it's more just curiosity and wondering whether I can save myself 60g from the jetboil while gaining some simmer control! That's admittedly limited by the useful range topping out at >50% though. The only reason I ran the kovea so low was that it started to direct a lot of flame around the sides of the pot, singeing the webbing handle and sleeve. You can just make out a tongue of flame in one of the photos above. It really does direct a lot of flame sideways and would be much better suited to a wider pot! I previously used the kovea stove with the Macpac pot which is pretty close to identical to the jetboil in width and height and recall having the same issue. The other consideration is cost, so run-what-you-brung is preferred. Though I have been eyeing off the Evernew alcohol stove system or Solo pot set Tier Gear are selling. Last edited by Singe on Mon 11 Jun, 2018 6:16 pm, edited 1 time in total. CasualNerd wrote: I love tests like this, you should totally keep it up. I've looked at jetboil clones because they're about $50 these days, but they are definitely heavier - I could spend that money on a Ti pot. Now that's interesting! Funnily enough I hadn't considered using a heat exchanger with an alcohol stove... No idea why not. I might rerun the tests a few times to measure fuel use and see where that gets me. Singe wrote: Very interesting - wouldn't've expected such a linear relationship! How does it impact efficiency? The faster you heat up the pot, the faster it boils. Linear is exactly what one should expect -- up to a point. It rounds off because faster is also less efficient due to the flame going around the pot. The efficiency looks kind of like the reverse of the speed. I'm not sure why it is also linear through much of its range. I've wondered about that. So it's a trade-off between speed and efficiency. If you want to increase efficiency for a given speed you have to do things like, well, add a heat exchanger. But then the trade-off becomes weight vs. efficiency. Stoves like the Jetboil are more fuel efficient but also heavier than a simple stove. If you want fuel efficiency for the sake of saving fuel then you go with the heavier stove. But if you want to save fuel in order to save weight it's trickier. The weight savings of the fuel (and empty canisters) might be less than the extra weight of the stove for some trips but more for other trips. I think that what you're trying to do will likely increase the efficiency somewhat. Or, for a given efficiency, increase the speed. But whether it's worth it or not is hard to say. I would guess it is not worth it. But regardless, you will probably find it entertaining to play around with. Just quietly, "Singe" is a great name for someone experimenting with stoves! Orion wrote: I think that what you're trying to do will likely increase the efficiency somewhat. Or, for a given efficiency, increase the speed. But whether it's worth it or not is hard to say. I would guess it is not worth it. But regardless, you will probably find it entertaining to play around with. ChrisJHC wrote: Just quietly, "Singe" is a great name for someone experimenting with stoves! 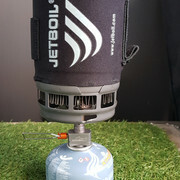 I just missed a massdrop on the Soto Windmaster stove as I was at perisher over the weekend with little phone reception. I have a feeling this paired with the jetboil pot might work better than the kovea with its convex burner, and it gets excellent reviews all round. Is/was not the Windmaster a similar price at Toms outdoors compared to massdrop? Soto seem to be the champs. Lamont wrote: Is/was not the Windmaster a similar price at Toms outdoors compared to massdrop?